Once the image has been printed, the ink is touch dry, the glass is then furnaced at a minimum of 600 degrees Celsius to cure and bond the ceramic ink to the glass. Furnacing brings out & sets the colour of the printed image. The time to complete the process is dependent on the thickness of glass necessary to cure the ceramic. What are the image requirements for a digital image? The highest possible resolution/quality image should be supplied to achieve satisfactory results. A 2mb image should provide acceptable quality at the minimum glass print size of 200mmx300mm. Exact requirements will vary based on the source image, as well as the intended use for the glass panel. Most common image formats can be accepted, though jpg or tiff formats are preferred. Images up to 10mb in size can be accepted by email, for larger files physical storage formats can be accepted (cd, dvd, usb stick, etc.) or a link to a file location in an online repository. We do offer limited photo preparation services, this can be quoted on a project by project basis. Text may be included in images at no extra cost, and should be embedded in the file as an outlined font in eps format. What are the limitations of the process? Unfortunately due to the nature of the inks used (in particular, the lack of substitutions for the toxic cadmium), bright reds are unachievable, as well as pinks. Cyan is another colour that is unable to be reproduced properly. Thus the inks used do not offer a ‘full colour’ range, however the specialist software used will process input images to achieve the closest possible colour match. Printing is size limited to a maximum of 3700x2200mm per panel. Contact the sales staff at G.James Glass Sales with your requirements, and they will be happy to assist. G.James branches are able to provide a full measurement service, which will also include an assessment of fit for purpose & duty of care requirements. Digital images are printed locally at our Brisbane facility, whilst monochrome graphics can also be produced at our Sydney and Melbourne facilities. G.James offers a full delivery service for our products, to both domestic and commercial sites. Our branches are also able to fully install the product. How do I look after my printed glass once I’ve got it? Any regular glass cleaning product may be used on ceramic printed glass – even something as simple as water with methylated spirits, applied with a soft cloth. The ceramic printing is resistant to cleaning products as it is bonded to the glass during the heating process. Products that are capable of damaging glass will also affect the ceramic print. The ceramic inks are resistant to fading, and are covered by a 10 year warranty. 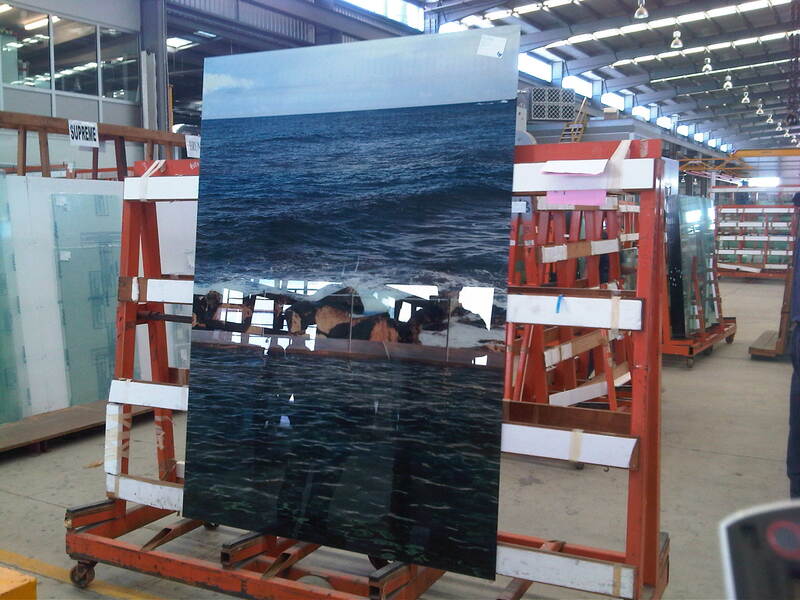 To find out more, please visit our glass printing gallery, or contact G.James Glass Sales on (07) 3877 2866. This entry was posted in Glass and tagged Ceramic Paint, Furnacing, High-Resolution, Printing, Toughening, Video. Bookmark the permalink.